PT Pelabuhan Indonesia I (Persero) - Pelindo I or referred to as "Inaport 1" is a state-owned port management services company in Indonesia which owned 100% by the government of the Republic of Indonesia. Inaport 1 operates primarily as a port operator in the western part of Indonesia which covers 4 provinces, namely Aceh, North Sumatera, Riau and Riau Islands. 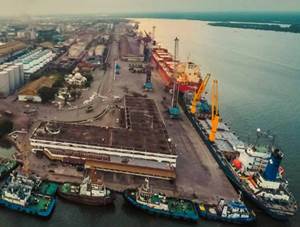 Headquartered in Medan North Sumatera, Inaport 1 runs its business through 16 port branches, 1 representative office, 11 port areas and 2 working units. Inaport 1 also supported by 4 subsidiary and affilated companies, namely PT Prima Terminal Petikemas Indonesia, PT Prima Indonesia Logistik, PT Prima Multi Terminal, and PT Terminal Petikemas Indonesia. In terms of financial performance, PT Pelabuhan Indonesia I (Persero) posted an increase of 11.70% in total revenues from Rp 2,095.52 billion in 2014 to Rp 2,340.72 billion in 2015. Total comprehensive profit amounted to Rp 715.30 billion in 2015, which represented an increase of 33.34% over total comprehensive profit recorded in 2014 of Rp 536.43 billion. This figures was quoted by JobsCDC.com from PT Pelabuhan Indonesia I (Persero) Annual Report 2015. Vocational High School (SMK) Engineering / Mechanical Engineering / Electrical Engineering / Civil Engineering. Willing to be placed in the working area of Inaport 1 and undergo a bond. Maximum age on 1 July 2016. SMK : maximum age of 24 years old. D3/D4 : maximum age of 27 years old. S1 : maximum age of 30 years old. S2 : maximum age of 35 years old. D3/D4 Nautical with ANT diploma I / II / III : maximum age of 35 years old. Have a diploma in accordance with the required formation. Minimum average value of the National Exam of 70.00 for SMK. Possess a minimum cumulative GPA of 3.00 on a 4.00 grade scale (for universities with accreditation A) or 3.25 on a 4.00 grade scale (for universities with accreditation B). For overseas graduates must attach proof of equality of Higher Education. Special S2 / S1 / D4 / D3 must attach a TOEFL Prediction / EPT certificate from trusted institution with a minimum score of 500. JobsCDC.com now available on android device. Download now on Google Play here. Please be aware of recruitment fraud. The entire stage of this selection process is free of charge. PT Pelabuhan Indonesia I (Persero) - SMK, D3, D4, S1, S2 Fresh Graduate Program Pelindo I Group July 2016 will never ask for fees or upfront payments for any purposes during the recruitment process such as transportation and accommodation.